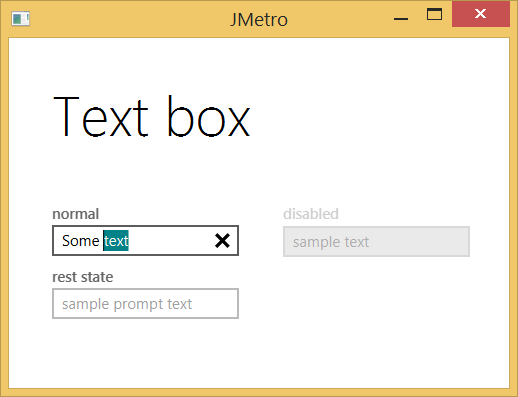 The Metro Text Box control is the usual input text field from which developers can get text input from users. This control has a particular trait usually present in control library designed to be used through touch: whenever the user enters text a clear button appears on the right most position of the control. 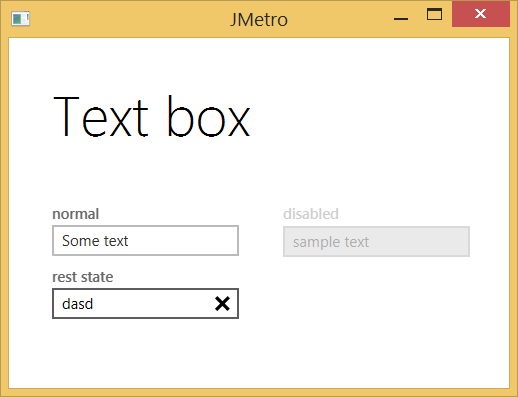 This particular feature isn’t available in the text input control from the JavaFX library, so the use of CSS won’t be enough to achieve a “metro” style. For this reason I’ve created a new control: ErasableTextField (Yes, I know, not the best choice of a name for a control 🙂 ), which extends from TextField and adds this missing feature: a button which appears inside the text input control to clear it whenever there is text inside. 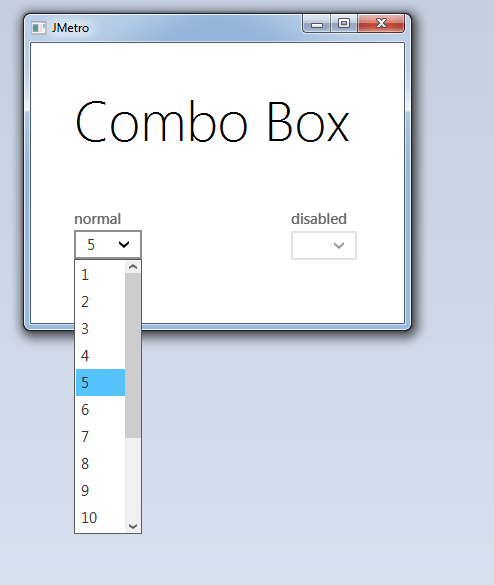 Then through the usual use of CSS I style the control to make it look like the Windows 8 Text Box. 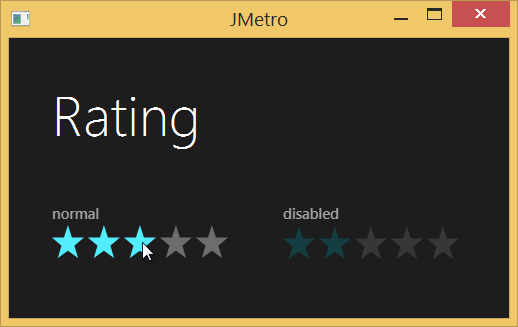 The Rating control is one of Windows first class citizens, it’s available in its control library, it allows a user to rate something from 0 to an x value. Given the importance of today’s social interaction it’s no wonder it has gained the status of a library control. ControlsFX is a third party library of controls for JavaFX, it complements the standard library with some more useful controls and functionality which are not available straight from JavaFX’s standard library. 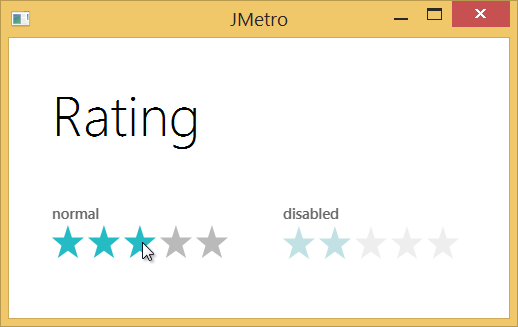 One of the controls present is the Rating control which I opportunely took the chance to use and style the metro way through CSS. “.strong” is the style class given to “selected” star buttons. For JMetro I wanted to use vector based images instead of raster ones. To that effect I used the CSS property: “-fx-shape” and set the “-fx-background-image” to null which is the same as removing it. By this, I’m not saying that vector based images should be used every time, there are certainly use cases where raster based ones are more convenient, specially at lower sizes. 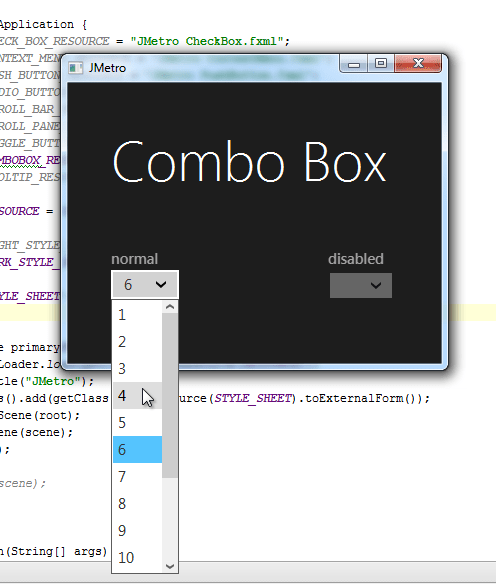 In conclusion, you can do some really powerful stuff this way using only JavaFX CSS code. You can either rely on the usage of raster based images or vector based ones. I’ll start this post by clarifying the purpose of this project. 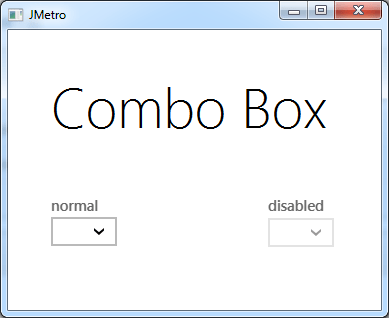 This project aims to provide skins for Javafx controls that are inspired by Metro style in Windows 8. 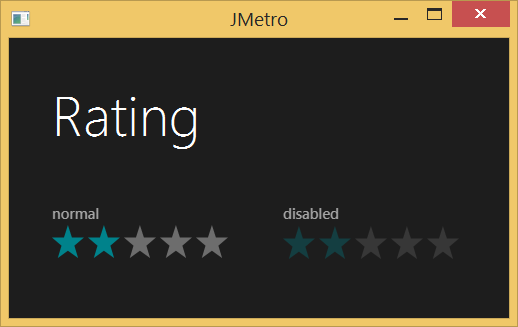 The light theme tries to match as closely as possible the Windows 8 look while the dark theme which is not available on windows 8 is inspired by the metro look and provides a dark version. 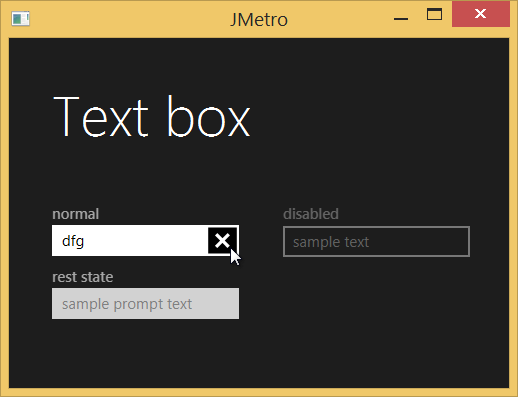 There are some controls that exist in JavaFX but do not exist on Windows 8, for those controls I’ll try to reproduce a version that I think matches as closely as possible the Metro guidelines. 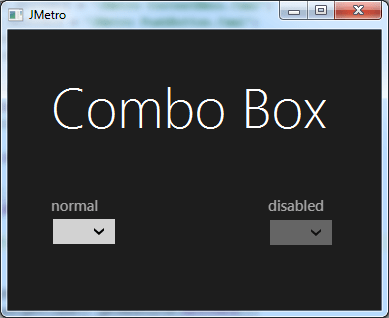 Finally, I’ve added one more style to the list of available controls: the ComboBox. Like I said before the light theme for this control tries to match as closely as possible the available version that exists on Windows 8, while the dark theme is a fresh new style inspired by the same Windows 8 control. 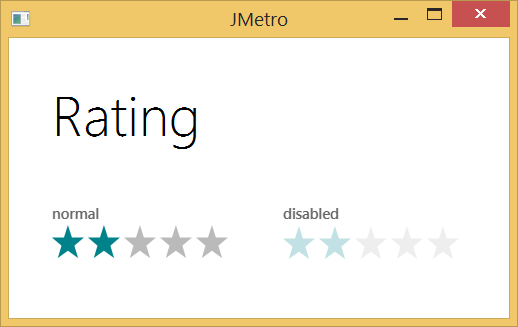 This time a new control that was not present on the JMetro for javafx2. The style is the same for the dark and light versions of jmetro. 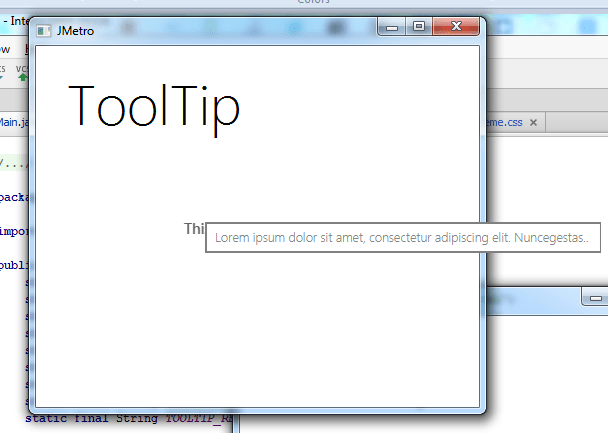 With javafx 2 it was not possible to style a Tooltip like this because it had a page corner like effect that wasn’t possible to remove.